I'm currently in the process of converting some of my Windows Phone apps to the Windows 8 Consumer Preview. While doing so I discovered there is no MessageBox.Show() method in WinRT. The alternative is to use the new MessageDialog class. This means I have to rewrite a lot of code which I try to avoid. 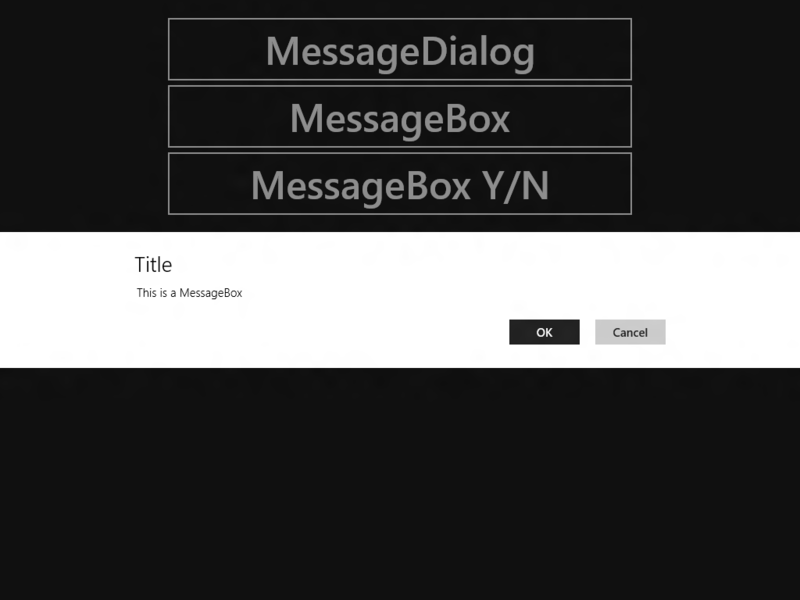 Therefore I came up with my own MessageBox helper class which mimics the behavior of the WP7 MessageBox. In this post I will demonstrate this, using the following sample application. As you can see I have marked the Button1_Click() method with the async keyword. This is necessary because the ShowAsync() method is called, using the new await keyword. The MessageDialog is shown in an seperate thread which will allow the main thread to continue to execute. This allows all animations running on the main thread to continue to play. My MessageBox show helper class makes my conversion much easier. You only have to change the Show() call to a ShowAsync() call and add the await and async keywords. //     Specifies the buttons to include when you display a message box. //     Displays only the OK button. //     Displays only the Cancel button. //     Displays both the OK and Cancel buttons. //     Represents a user's response to a message box. //     This value is not currently used. //     The user clicked the OK button. //     The user clicked the Cancel button or pressed ESC. I have also added the 'Yes' and 'No' Buttons to the MessageBoxButton enum. This is something I was always missing in the Windows Phone API. Now you can not only use OK/Cancel but also Yes/No/Cancel. Download my sample project which contains all source code. very handy, thank you for posting.